In the budget-friendly kitchen makeover my Mom and I are working on at her place, we’re trying not to replace too many things and work with what’s there as much as we can. Cabinets, counters, appliances – they’re all staying. But the white acrylic sink (that Mom had to regularly bleach, thanks to years of use and the resulting cracks where coffee would settle and stain) and old faucet (with a dint from a knife – long story) were just in really rough shape. There were many reasons my Mom chose the Tamera faucet. My Mom loved the modest size of the Tamera. So many faucets today are designed for much grander kitchens than the one in my Mom’s tiny, post-war home. 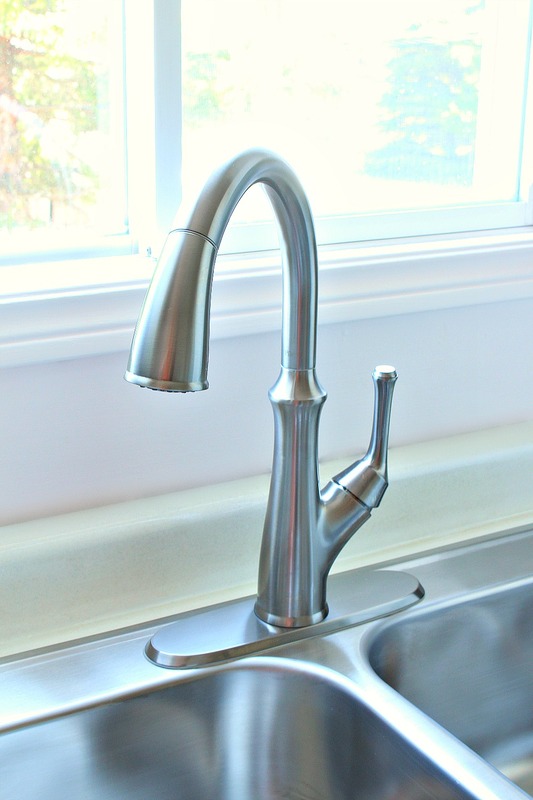 She looked online at the specs, and some of the faucets would have reached really high on the window – or had a really substantial, chunky look – so Mom looked for a faucet that still had a graceful arc spout but wasn’t so incredibly tall or heavy looking. This postwar home has a lot of original details (almost all of the wood interior doors, thick wood trim, original hardwood floors, brass door hardware) but my Mom’s decorating style is fairly modern, with some vintage and mid-century touches. We’re going for a look collected over time. The Tamera doesn’t look too traditional, nor does it scream modern loft condo – it’s the perfect blend of old and new, a great option for a transitional decor. Although we’re dabbling with some brushed gold, I’m encouraging my Mom to mix metals in her house. 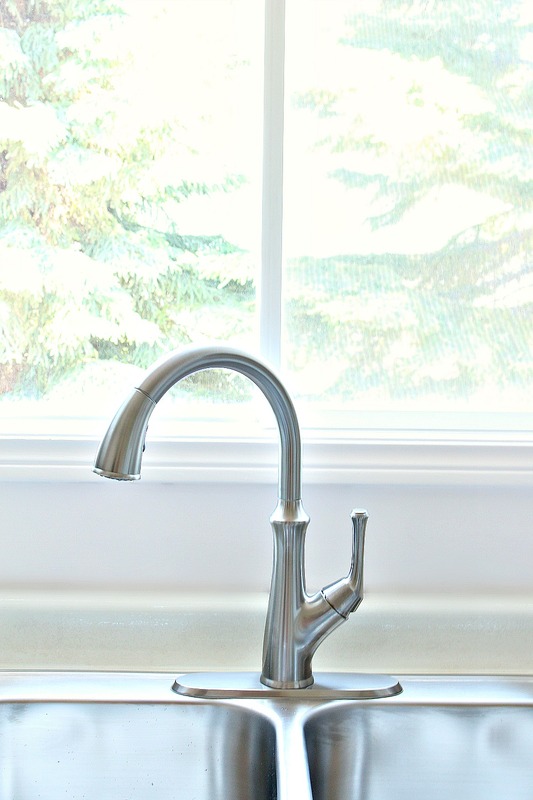 We liked the stainless finish on this faucet because it matches her new sink perfectly, so the overall look, even though we’re mixing metals, won’t look too busy or disjointed. Having seen how wonderful a pulldown kitchen faucet is at my place (I have the gorgeous Lita in the stainless finish), my Mom wanted that same feature. It makes cleaning out the sink or filling a nearby pot so easy. I can’t imagine my kitchen without this option! The dual-mode spray head is super handy too, so my Mom had that feature on her checklist. The optional deckplate was perfect, because the sink came with three holes. Beyond that, she wanted a single lever for ease of use, but no other bells or whistles. You’ll have to excuse the mess, but when I went into town to start the kitchen project, the clouds were forming and the whole house looked dark. I wouldn’t let Mom putter or tidy because I needed to take “before” shots ASAP before I lost the light completely. But you get the idea: 1980s white acrylic sink with a standard issue 1980s faucet. Already it looks fresher and newer! 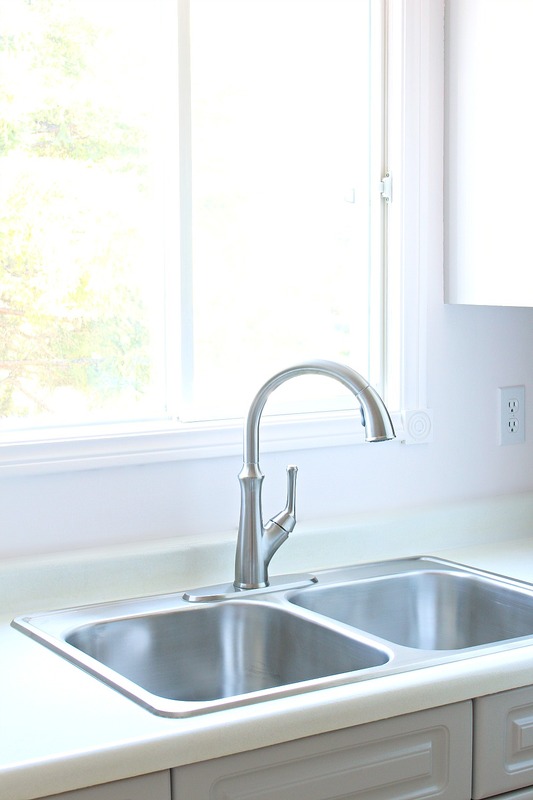 Mom is THRILLED with her new sink and faucet – and kitchen progress in general. It’s actually so sweet to see her beam with every new detail, even though in the beginning I really felt like we were just putting lipstick on a pig over there. Sometimes it’s just nice to freshen things up a little, even if it’s temporary and not perfect. The faucet, however, Mom can take with her when she renovates for real. UPDATE: Check out the whole budget-friendly, pink gold & grey kitchen makeover right here! I can't wait to see what you do on the countertops! I've been going back and forth about what to do with our cream laminate countertops (that are in excellent shape) now that we have navy lowers/white uppers in the kitchen. Not quite ready to shell out for all new counters but can't stand the awful contrast much longer! Oooo, that's a touch one! I hate when things are in great shape, just not my jam – it makes it so much more difficult to decide on a risky makeover that might ruin them.Well, I'll spill the beans to you: we used the Rust-Oleum countertop transformation kit. I was expecting white, but the clear coat really yellowed. The creamier white is fine because what was there was really damaged. But I'm not sure you'll find a colour in the Rust-Oleum selection (it's pretty limited: black, creamy white, brown, sand).Have you thought about butcherblock? With the right protective top coat, you can stain wood counters any color (if the traditional yellowy wood isn't your taste)? Ikea sells a pretty inexpensive version, as do a lot of lumber yards, lumber liquidators, etc. New stainless steel sinks looks much better than old one acrylic. Also it is much easier to clean it. Good decision. I loved how bright and light the white acrylic was, but it was just a nightmare to clean. I think Mom's days will be easier, with one less thing to scrub! Excellent choice of Tamera faucet. 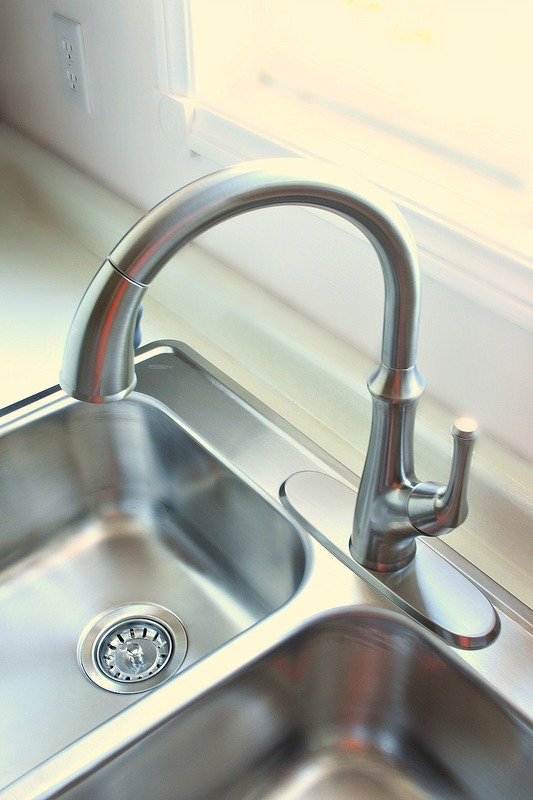 I also have pulldown kitchen faucet at my place and I could not imagine that I have faucet without it. Great story, hope your mom is satisfied with this little upgrade. She's thrilled! The little changes we've made have prompted a whole home declutter for her. She's been on fire making the house look nice! Very nice, wish i had one of these style faucets. The pull down feature is THE best. 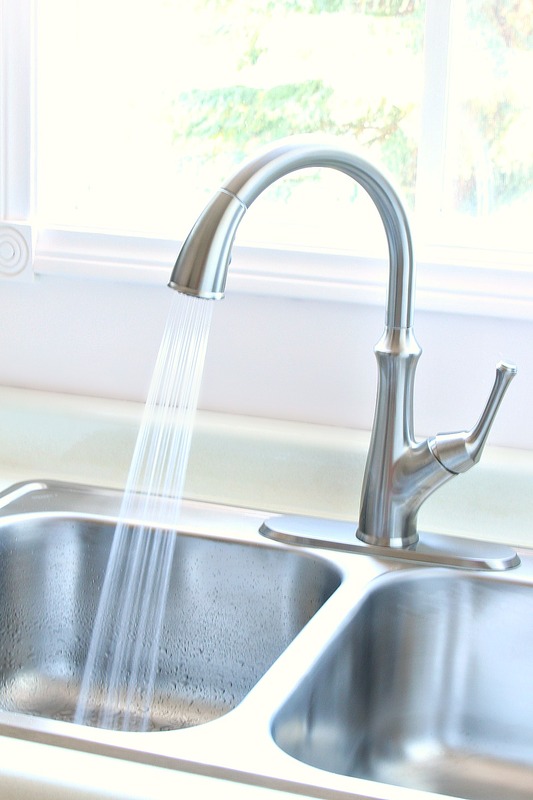 I'm never going back to a regular faucet – it's just so useful. If I can ever wrangle a faucet giveaway, I'll be sure to let you know (ya never know). Awesome. I have one of the regular basic faucet with the spray nozzle on the side, but it's a bit of a pain to pull out. I always wanted one of these but couldnt because I had a portable dishwasher, but I got rid of that so I totally need one of these in my dish washing life. Great post for my wife.Thank you so much. I will share it on my facebook? Kitchen faucet is quite important. For me, I like your faucet's style. I think I'll buy one for my new house. Thanks so much! I love your faucet. My wife will need this post for a new faucet. Our old faucet is really terrible. Thanks for sharing. Faucets definitely see a lot of wear and tear, so it's nice to upgrade once in awhile. I'm sure your wife would love this – BOTH my Mom and Dad are really thrilled with it. I love your faucets style. Already in my must-buy-list. And also those catus. So lovely! Aren't they the cutest? My Mom's plants are loving the kitchen light. She has all of my vintage pink McCoy planters so we'll be using them to add some color to her kitchen. The faucet looks awesome! I really think I should get one with similar pull-down feature like this. Who says faucets have to be boring and plain all the time? Any additional progress to report on your mom's kitchen?